There’s been a lot of talk this year that the vacation season won’t be the same. You hear about families staying home rather than break the bank to pay for the gas necessary to drive to Wally World. Also, I’ve seen a couple of cable news stories about how vacations are increasingly culturally passe in this work-all-the-time world. And then there are the economic concerns. Might not want to take a long vacation if you smell layoffs coming. But if you are taking some time off, we are now officially entering the season to do so. Here’s a quick checklist of things you should do to prepare yourself (and your boss; and your coworkers) for a restful and successful vacation. Decide now if you’re going to do any work while you’re on vacation. 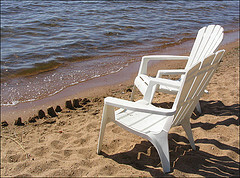 Careerbuilder says 1 in 4 workers plan to do some work while on vacation. This is an all or nothing decision. It’s like being “kinda pregnant.” You are or you aren’t. Doing things halfway doesn’t work out well. If you want to make a clean break, you should dot all your I’s and cross all your T’s now. If you’re going to be available in certain situations, you have to make sure your lines of communication are open. Set the table now so there is no confusion. If you ARE going to be in touch (even if just to monitor things) while away, make sure to check the lay of the land ahead of time. Don’t blindly assume the lodge or Grandma Sarah’s house will have internet access… or even cell phone coverage! Inquire ahead of time if you need specific tools available. Whatever your ultimate decision, make sure the boundaries you settle on are widely known and understood. Under what threat of emergency are you willing to be contacted, and at what number? Try to bring all open projects to a conclusion. This makes it easier for your co-workers (they’re not waiting on your return to move things forward) and it makes things easier for you. You’ll be much happier to come back to a clean slate. To that end, clean your desk. Everything must go! Answer all outstanding voicemails. Clear out your email inbox. If you make a clean break, it will be easier to hit the ground running when you come back: anything on your plate when you return will be new business because you closed all old business out before you left. Right now, before you leave, make a to-do list of things you expect you’ll need to tackle when you get back. Don’t rely on your memory after a week at the beach to remember about that important lunch appointment the Tuesday after you get back. Set your email out of office autoreplies. Click here for step by step instructions on how to do so. If someone is covering for you, make sure all of your usual contacts know who this person is and how they can be contacted. If someone is covering for you, meet with them and set up a plan. Eliminate any chance of surprise. Make clear what they can expect and what you’ll expect when you get back. Don’t feel guilty. No matter what the modern work ethos is, everyone deserves a vacation now and again. Even you. Looking for a job–or trying to find a better one? Want advice on how to balance work and family life? Send your story or question to “Good Morning America” workplace contributor Tory Johnson and she may offer you on-air solutions as part of her ABC News Now show “Homework”! I guess I’d better finish my jobs right this instant to be able to enjoy my vacation. I’ll be looking forward to the next payday! If I’ll combine the money I’ll earn by then and the money from the loan my husband had, we’ll definitely be able to book early!